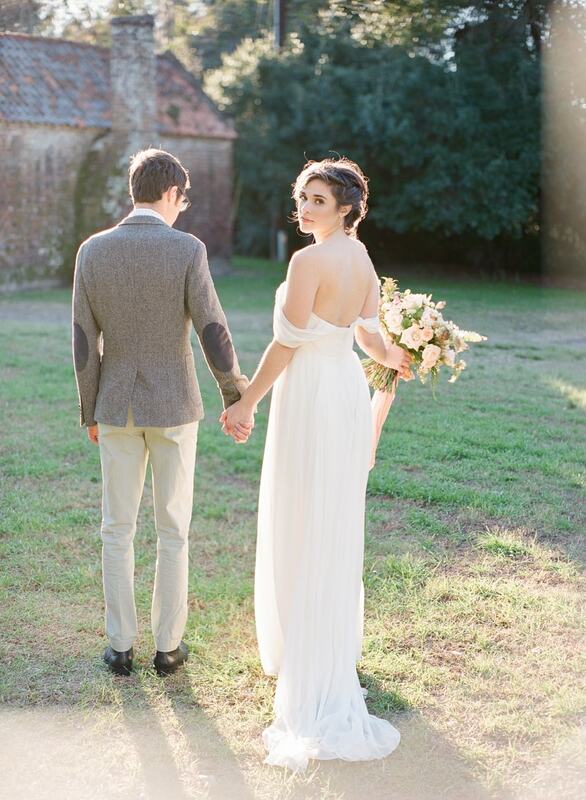 Charleston SC Wedding Inspiration. This styled inspirational shoot at the Boone Hall Plantation in Charleston, S.C., built upon the concept of grace to deliver a dreamy experience worthy of praise. 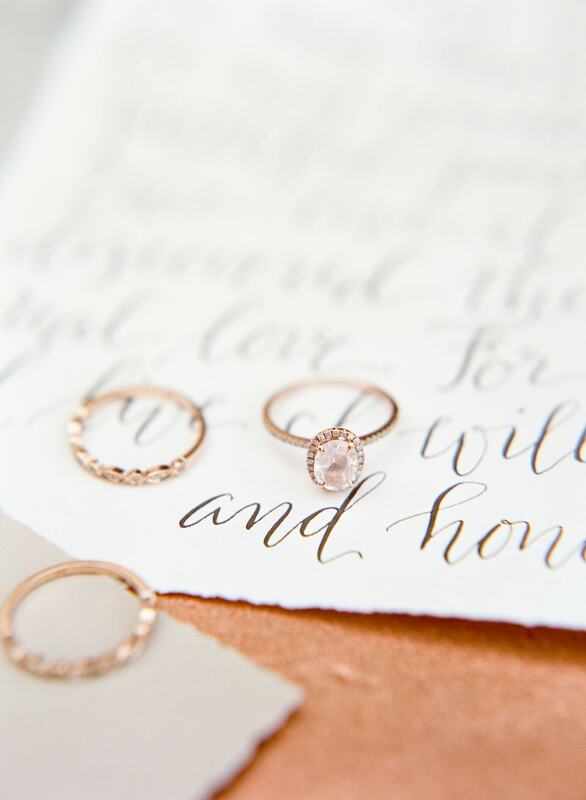 The color palette is utterly romantic with blush, cream, and gold. From the invitation suite, outfitted with a light pink floral design and gray envelopes with striking script, to the abundance of delicate florals, each detail is sophisticated and amorous. The bride is styled in an off-the-shoulder gown with a sweetheart neckline. The fabric flutters in the breeze and offers a flattering silhouette. Her hair is braided along the front and curled and tucked in the back. She accompanies the style with a long veil and beautiful rose gold teardrop earrings. The groom evokes a modern style with a gray suit jacket, patterned white shirt, and white and pink bow tie. He also wears stylish glasses and a bold pocket square. 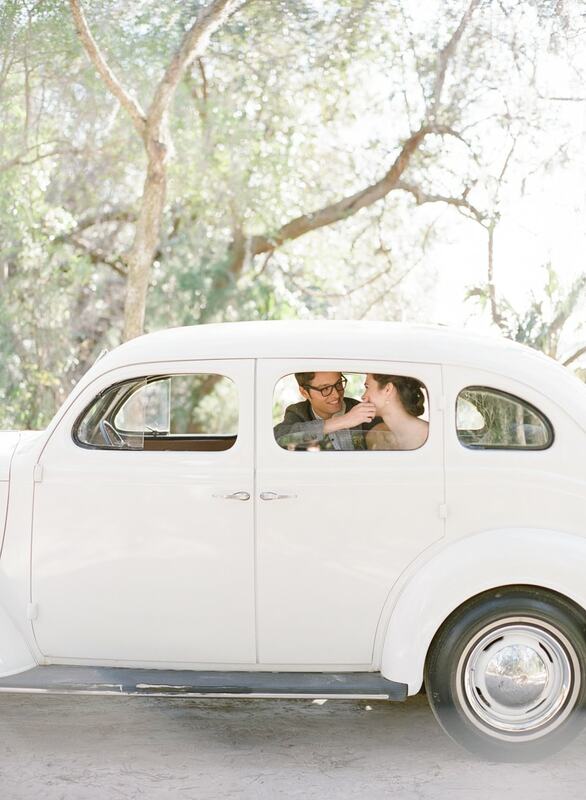 A classic white car is the perfect starting point for this couple. 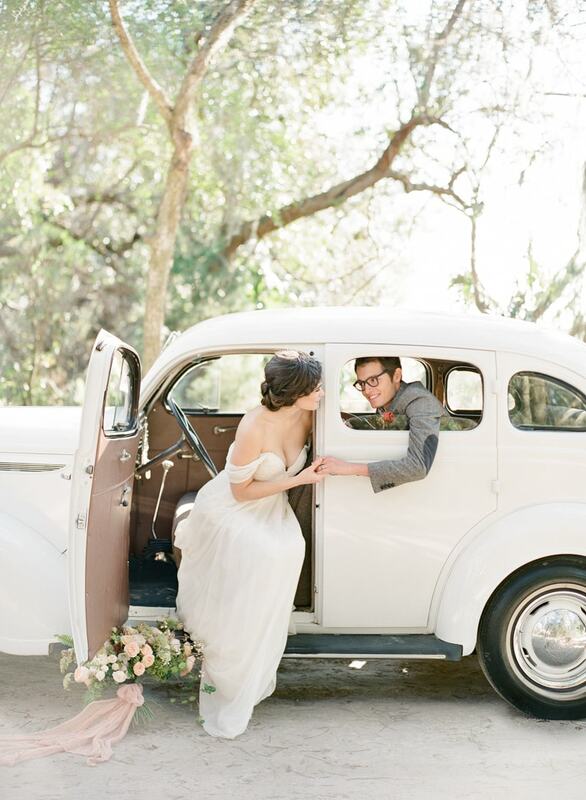 Whether they're coming or going, this vintage ride has all the elements for a graceful entrance or exit. From the decor on the gates, to the centerpieces, to the bride's bouquet, the floral arrangements boast inventive combinations that are vivacious in a pretty, pastel fashion. An intimate ceremony might take place in front of the gates, with a modest arrangement of golden chairs. The same chairs are used at the reception space– a natural wooden table covered with a textured pink cheese cloth runner. The floral arrangement in the center is anchored by tall pink pillar candles and place settings that include modern crystal stemware, gold flatware, gold chargers and white china. To end the celebration on a simple and sweet note is a truly original cake. Instead of an ombre color, the ombre style comes in the form of buttercream. The bottom tier is entirely covered in white, while the middle tier is lightly-coated in buttercream. The top tier is a naked cake with a sweet and lovely dripping. The cake table is decorated with the simple addition of eucalyptus and candles. The quiet beauty of this styled shoot shows how a graceful wedding can come to life. But grace doesn't come from a color, or a theme, or even a location. It has to come from within. Grace is delicate. It’s gentle, never forced. It’s pretty with subtle refinement. It’s a soft gaze, a light color, and a peaceful whisper.